“Just breathe.” You’ve heard that advice before, and for good reason. There are so many health benefits to effective breathing — revitalizing your body and energy levels, improving your immune response, reducing stress and anxiety, and ensuring your body’s optimal performance during exercise, to name a few. It seems amazing that something that is free and so readily available to all of us can have such a powerful effect on our health and performance, but it absolutely does. 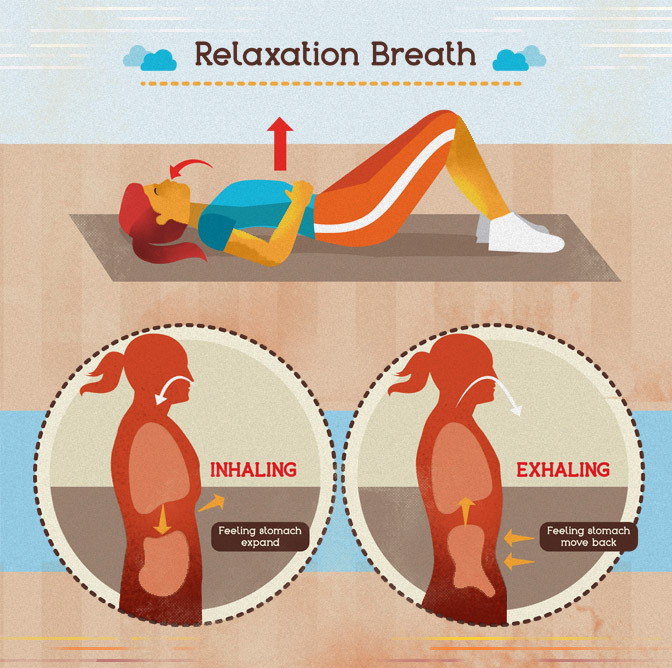 It just takes proper technique and a bit of practice to experience the effects of proper breathing, and with long-term consistency, the benefits can be huge! We breathe naturally without thinking, so it’s interesting to stop and consider proper breathing technique. What do we mean by that? There are a number of different techniques targeted toward achieving specific effects in response to various intentional and unintentional stressors to the body. Some fight anxiety or aid relaxation. Some help sports performance. Still others improve digestion. We’ll explore some of those specific techniques in a moment, but let’s keep things easy to start — as simple as breathing. Keep in mind that just by taking in as much air as possible and exhaling as completely as possible, you are already giving your body more benefits from each breath. The bottom line is that our organs need more oxygen for optimal performance, and they need something to stimulate a steady release (outflow) of carbon dioxide. If our organs are happy, we feel better, so anything we do to increase oxygen flow improves our overall health. When we breathe automatically, we tend to take in the bare minimum during inhalation, filling our lungs with about half a liter of air… but our full lung capacity is four to six liters! As a result, our exhalations are shorter too. We don’t release enough carbon dioxide to make enough room for more fresh air. And when we’re under emotional stress or anxiety, our breaths become even shorter. 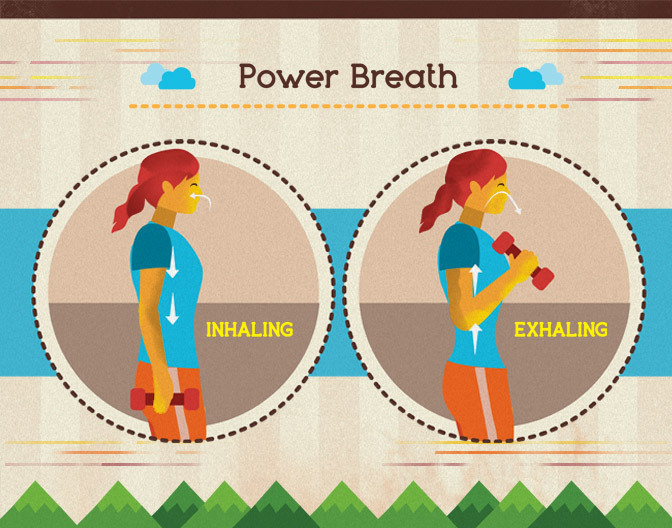 When it comes to breathing for good health, there are several techniques you can practice. I would propose that you start with the simplest option: Breath through the nose deeply, focusing on filling the belly and then the chest with air, slowly counting up to four or five seconds. Then, exhale the same number of seconds by first emptying the chest then squeezing all the air out of the belly. To start, practice this technique for five minutes once a day as well as whenever you feel challenged or stressed. Make sure your spine is erect (whether you are standing, sitting, or lying down). If you place your right hand on your navel and your left hand on your chest, you should be able to feel and follow the movement of the air. In time, you should be able to extend the number of seconds in each inhalation/exhalation to eight seconds, nine seconds, and more, taking in more oxygen and squeezing out more carbon dioxide. You can practice this technique any time, any where, but it’s also highly effective when combined with movement in practices such as yoga and Qigong. In fact, if you do yoga and aren’t being mindful of the synchronization of breath with movement, you’re missing out. The breath is actually quite integral and a big contributor to the wonderful energized feeling we all experience during these healing practice… not to mention how it helps us power through some of the more challenging moves and poses. Practicing nourishing programs such as Qigong and yoga that replenish energy with the help of the breath is an exceptional cross-training tool for runners, those involved in high-contact sports, and cross trainers. Studies have shown that breathing in this way raises levels of serotonin, which can ease symptoms of depression. Once you work up to it, a good 20-minute session can increase the flow of oxygenated blood to the brain, helping to improve mental focus and concentration. With lengthened sessions and consistent practice, this breath work ensures sufficient intake of oxygen and can even lower blood pressure. Beyond this basic deep breathing, there are other more advanced methods for controlling our breath that can be used to improve performance during exercise (when a big jolt of energy is required, for example) or to calm us when we face overwhelming stress. Alternate nostril breathing, for instance, provides calm and balance. For three minutes or longer, inhale into the left nostril while blocking the right then exhale out of the right nostril while blocking the left one. When the pattern is reversed (inhaling through the right and exhaling through the left), you experience an energizing, awakening effect. We can also leverage the breath for improving athletic performance. 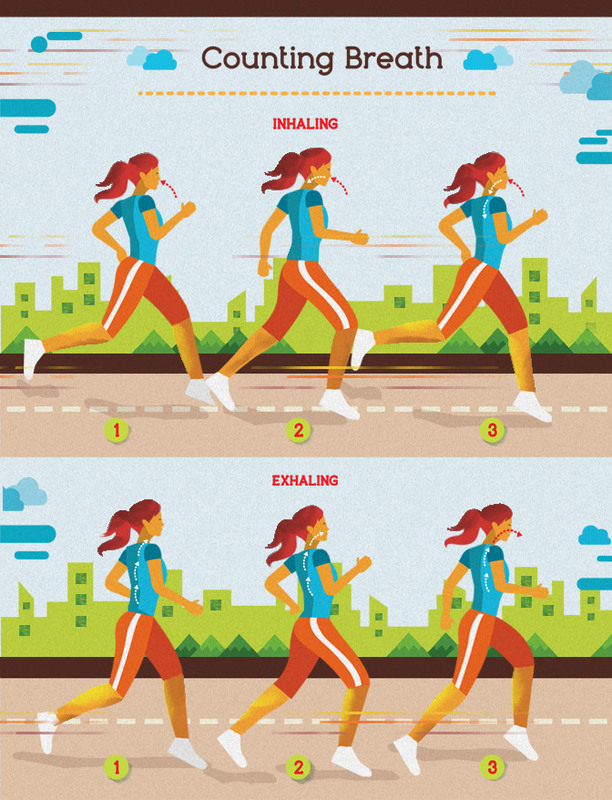 Here are a few sports-specific breathing tips you can implement right away: Runners, lengthen your inhalations and exhalations by pacing them with your steps (see image above) to improve your speed and endurance. Basketball and football players, if you anticipate a load/impact, breathe deep and brace your core; this will make it more difficult to knock you down and will protect your spine. Weightlifters, exhale during the effort phase of an exercise to help manage the load and maintain lumbar stability. So whether you are an athlete or just looking to improve your overall health or mood, there just isn’t a simpler or more cost-effective tool at your disposal than your breath. Be mindful of it! About Rachel Moncayo: Rachel is part owner of Brookhaven Fitness Studio and co-founder of the Quantum Fitness concept, which incorporates a mix of mind-muscle training, nutrition, and functional exercise. She has 30 years of fitness and meditation experience and education, holds TRX Training certification, Reiki Level 1, and a Yoga RYT 200-hour Yogaworks certification.